Worried that you haven’t tried your hand at Mountain Biking yet and that time is running out? Well worry not, as Tignes Mountain Biking and the Palafour chair lift is still open until the 31st August. Want to know the best bit? The lifts and bike park are Free, yes you read that right, Free! So why go Mountain Biking in Tignes you might ask and not one of the more well-known resorts such as Morzine? Well, Tignes is perfectly set up for mountain biking in the summer with a handful of lift accessed zones and plenty of cross country and enduro riding. Tignes also has some of the most diverse bike terrain in the Alps due to the resorts high altitude. Here with the family? 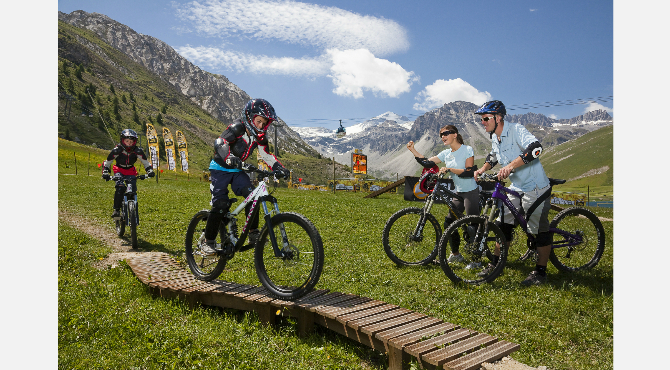 Mountain biking in Tignes is suitable for all levels, so great to get the family together for a day out too. 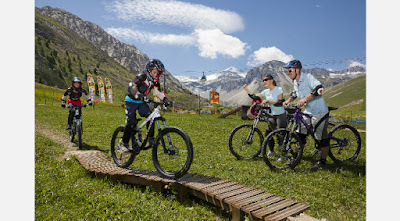 Here in Tignes, there is a mountain biking trail for everyone and with five lifts spread out over the Tignes and Val D’Isere area they are easily accessible. In Tignes you have the Tufs chairlift, the palafour chairlift and the Toviere gondola which provides access to Val D’Isere. If over in Val D’Isere you have access to the Olympique cable car and the Borsat chairlift. Just like the Ski Slopes in the winter, mountain biking trails have different levels of difficulty, so be sure to know your own ability, strengths and weaknesses before hitting the trails. Never tried your hand at mountain biking before? Green trails are perfect for beginners, easing you in steadily, you will be a pro in no time. Already tried your hand at mountain biking and downhill riding? Then blue trails will help to improve your skills. Got the mountain biking bug? Enjoy spending time on the red trails. Consider yourself an expert? Then black and double black trails will get your adrenaline flowing. Not sure which level you are at? Then head to Bike Land in the center of Le Lac where you can assess your level thanks to three green, blue and red modules lines at your disposal. Feel ready to tackle the trails of Tignes? Before you do be sure to have the correct equipment and adhere to the safety rules. The trails of Tignes are open to Mountain bikers under their own responsibility and Tignes, Val D’Isere, the STGM and the STVI cannot be held responsible for any injuries caused to Mountain bikers. So please remember to wear a helmet, this is compulsory! Refer to the signs at all times, they are there to help and guide you. Mind the pedestrians. Pedestrians have priority on the ‘all mountain’ and cross country trails, stop and let them go first. Mind the herds. You may come in to contact with herds grazing on the mountain, remember to ride slowly. Once you have got all that, just remember to have fun!